Please remember that the £15.00 entry fee for the Tumble Club League is due in by Saturday 30th April. This is the final Tumble Club League competition of the year! The entry fee for the Tumbling Development Camp should be paid by Sunday 1st May at the latest. The cost is £15.00 and should be handed to a coach in a sealed envelope. This session is only open to gymnasts who qualified for the Tumble Regional Final. This session will include a closed competition which will be great preparation for all gymnasts. We are going to have a parents/carers meeting on Thursday 28th April at the end of training. If gymnasts don’t train on a Thursday then carers can be updated on Saturday morning. We have received some information however, are still awaiting final confirmation. Hopefully travel arrangements can be made asap! If any gymnasts have an outstanding entry fee for this competition please pay asap. The same applies for any regional kit which was ordered. This year our annual display will be held in November (date TBC). As always our display will include all gymnasts from all sessions. Please pass this message on so everyone is aware. Our fundraising committee are organising an end of term disco on Friday 20th May. The disco is for all gymnasts and will be held at Cadder hall, Bishopbriggs 19:00 – 21:00. Tickets will be on sale asap. Please put this date in your diary! 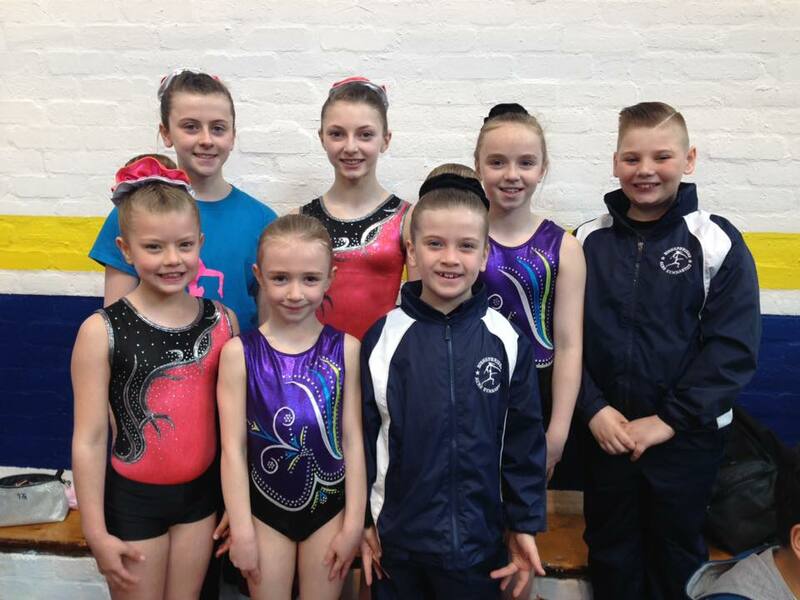 Well done to all of our gymnasts who competed at the West of Scotland Charity Championships on Sunday. Lots of great performances and over £2000.00 raised for charity! An extra special well done to Gemma & Lily and Jordan & Mia who won gold medals. Fantastic! We have now introduced leotards for our gymnasts selected for our tumble squads. These leotards will be used for competitions and displays. We would recommend that all squad gymnasts purchase the leotard now so they have them for the tumble competition in October. All order forms must be returned by the end of April. Orders will not be taken again until the end of August which is why we recommend they are purchased now. Please keep up to date with all cancelled sessions via the ‘Dates for your Diary’ section of our website. We have added a few additional sessions which are cancelled due the the halls being used for elections. Follow us on Instagram @Bishopbriggsacro. We have lots of videos and photos of acro and tumble!